The best chance to beat breast cancer is by receiving an early diagnosis. 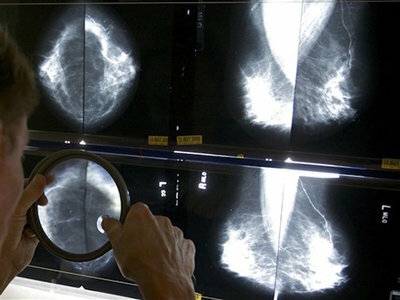 More than 90 percent of women diagnosed with breast cancer at the earliest stage survive for at least five years , compared to nearly 15 percent for those diagnosed with the most advanced stage of the disease. Many patients worry about what’s involved in a breast cancer screening; they may not understand what happens or are simply too afraid of the possibility of what the tests may find. Learning more about how breast cancer is diagnosed through one or more of the options below can help clear up the mystery behind a scary process that lead some patients to avoid a check that can save their lives. The methods, themselves, are not a big mystery and should be studied carefully for maximum effectiveness. Self examination: Early breast cancer detection can start before someone visits a doctor. A breast self-exam can often detect smaller changes in a breast before a doctor. This is because a woman knows her own body better than anyone else. The American Cancer Society recommends that all women (starting in their 20s) should perform a regular breast self-exam. This helps a woman become familiar with the size, shape and feel of her breasts. With regular exams, a woman is more likely to recognize any potential changes over time. It is important to note that a change in a woman’s breast does not necessarily mean cancer is present. However, if changes are found during a self-exam, then it may be time to take the next step. Make an appointment with the doctor: Make a call to the doctor’s office and set up a time to follow up on what was found during the self-exam. It is important to try to stay calm both when calling the doctor and when going into the appointment. Even if nothing is found during a self-exam, make sure to ask the doctor about doing a check when your in the office. A doctor has special training regarding doing a breast exam and can offer more reliable results. If the doctor recommends more testing, again, it’s important not to panic.. The majority of these discoveries ( 8 out of 10 ) are benign (non-cancerous), but further evaluation is essential to make sure everything is normal. Mammography: a mammogram is an x-ray machine used to examine breast tissue. It detects tumors before they can be felt during a self-exam. The mammogram shows small groups of calcium called microcalcifications. The test cannot indicate if a growth is cancerous; it can only detect that a growth is present. Doctors recommend that all women age 40 and older should get a mammogram every one to two years to keep ahead of changes in breast tissue. Any woman under age 40 who has an enhanced risk of breast cancer (genetics, lifestyle risk factors) should consult her doctor to determine how often to have a mammogram. MRI and Ultrasound: These two diagnostic tools, magnetic resonance imaging (MRI) and ultrasound machine, are used to help doctors study possible abnormalities in breast tissue. The MRI uses magnetic energy to create images of the breast, while the ultrasound uses sound waves to make the images. Both of these machines can determine if the growth is a fluid-filled cyst or a solid mass. Once the images come back and are read by the radiologist, a determination is made on the necessity for a biopsy. Biopsy: The word biopsy is often the most scary for patients, because it means something abnormal was found, but a conclusive diagnosis still is not available. A biopsy test removes tissue or fluid from a lump or growth. These cells are studied under a microscope and then subjected to further tests to see if breast cancer is present. The biopsy is the only definitive test to conclude whether an area is cancerous.